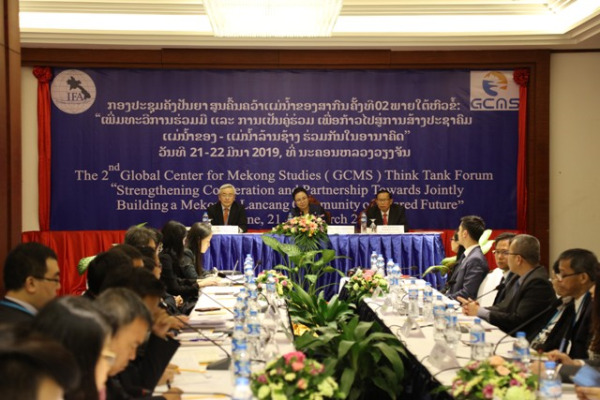 (KPL) The 2nd Global Center for Mekong Studies (GCMS) Think Tank Forum was held in Vientiane Capital on Mar 22 for the discussion of the five-year Plan of Action on Lancang-Mekong Cooperation (2018-2022). Held at the Landmark Hotel, the meeting saw the participation of the Deputy Minister of Foreign Affairs Khamphao Eurnthavanh, the Director General of the Institute of Foreign Affairs Khamsouay Keodalavong, the Director of GCMS of China Rong Ying and members of GCMS from Cambodia, Myanmar, Thailand and Vietnam. “It’s the ultimate goal among nations to promote and maintain regional and global peace, security and stability. Hence, various initiatives for broadening and deepening cooperation are a crucial mean to achieve this goal,” said Ms Khamphao. Since the Meekong-Langcang Cooperation (MLC) was officially established by the leaders of six countries in 2016, only three years now, the MLC has become a comprehensive mechanism, covering a wide range of areas, namely political and security cooperation, economic and sustainable development, to social-cultural and people to people exchanges. These priority areas endorsed by the leaders of the six countries are, indeed, consistent with the development needs of the MLC member countries, as well as of the region and the world at large. In recognizing the importance of the MLC’s cooperation framework, countries in the Mekong region and China have made efforts in collaboratively implementing initiatives and projects in priority areas in order to maximize the benefits for their nations and peoples and the region as a whole. MLC framework also makes a contribution to enhancing the cooperation among the Mekong countries, which enables this sub-region to make a remarkable progress in association with other regional mechanisms under the principles of mutual respect and shared benefit. Significantly, MLC has promoted jointly building Economic Development Belt, the high quality connectivity, and innovation and e-commerce. Laos currently focuses on implementing industrial production capacity cooperation, which is essential for developing countries, in order to promote joint sustainable development. The country will also continue to enhance connectivity cooperation among MLC. In order to align with the regional mechanisms for regional connectivity, for instance, ASEAN Connectivity framework, ACMECS and GMS, in order to promote comprehensive connectivity among Mekong-Lancang countries and ASEAN as a whole. “Although our forum is relatively new, it becomes an open and inclusive platform, which offers opportunities for the GCMS members, and representatives from other countries in the region and regional organizations to meet and discuss various issues in the MLC framework, ranging from political and security cooperation, economic and sustainable development, to social-cultural and people to people exchanges,” said Ambassador Khamsouay Keodalavong. Through regularly meeting and conducting workshops and joint research for providing recommendations to the governments of the MLC countries, I strong believe that our forum will not only be a part of those implementing the five-year plan of MLC, but also a key player in shaping the future of MLC, added Ambassador Khamsouay Keodalavong.